I have had the pleasure of knowing and working with Sheriff Cain for many years. He epitomizes what we refer to as a career law enforcement officer. Sheriff Cain has spent the majority of his adult life, 42 years, working for the citizens of Daviess County Kentucky as either the Sheriff or as a Deputy Sheriff. He has held the position of Patrol Deputy, Chief Deputy, Chief of Investigations, and Sheriff. Prior to joining the ranks in Daviess County, Sheriff Cain proudly served his country as a Marine fighting in the rice paddies and jungles of Vietnam. I guess one can surmise that his entire adult life has been spent in the service of others. Once sworn in as a Deputy, Keith Cain was not one to be satisfied with the status quo. If he was to make a career of law enforcement, he was going to obtain and study every scrap of knowledge he could find, striving to increase and perfect his knowledge and abilities as a law enforcement officer. While serving as a full-time Deputy, Keith also managed to obtain a Bachelor of Arts (B.A.) degree in Criminal Justice from Kentucky Wesleyan College, and a Master of Arts (M.A.) in Education from Western Kentucky University. He is a graduate of both the F.8.1. National Academy in Quantico, Virginia and of the National Sheriff's Institute in Longmont, Colorado. Along the way, he has also successfully completed numerous schools and seminars across the nation on various topics related to the Criminal Justice profession and Leadership. Not only is he certified as a Police Instructor by the Kentucky Law Enforcement Council, he has lectured extensively nationally and has published several articles concerning the escalation of methamphetamine use and its impact on law enforcement and the community. Keith's work in the Commonwealth of Kentucky has been nothing short of tireless. He spent 25 years, what many of us would consider a complete career, establishing himself as an honorable Deputy Sheriff and a tireless Investigator. After first being elected in 1999, he is now in his fifth term leading what many consider to be one of the top Sheriff's Offices in Kentucky. He is an adjunct instructor at the Owensboro Community and Technical College where he teaches Criminal Investigation, Criminal Procedure, and other selected topics in law enforcement. He also chairs the institution's Advisory Committee for the Law Enforcement curriculum. He is a 1993 graduate of Leadership Owensboro and was recognized in 2001 as their "Outstanding Alumni" in Justice. Statewide, Sheriff Cain has long been a member of the Kentucky Sheriff's Association having served as this body's President in 2004 and 2008. Since 2001, Keith has served on the Kentucky Law Enforcement Council. In 2008, he was elected Chairman of the KLEC and currently serves in this capacity. This position alone has enabled Keith to have a broad impact on certifying law enforcement training for all officers in Kentucky. His tenure in Kentucky has garnered Sheriff Cain numerous awards. In 2003, he was recognized as the Kentucky Sheriff's Association as their "Sheriff of the Year". In 2004, he was recognized as the Green River Regional Triad "Sheriff of the Year''. In August of 2004, Sheriff Cain was a recipient of the "Governor's Award for Outstanding Contributions to law Enforcement". He was, again, presented with this award in 2008, making him the only person to date to have received this award twice. In 2005, Sheriff Cain was awarded the Kentucky State Police Aide de Camp Award by the KSP Commissioner Mark Miller for his work on comprehensive methamphetamine legislation passed by the General Assembly. In 2008, Sheriff Cain was the gracious recipient of the NAACP's President Award. And in 2010 he received Kentucky Wesleyan College's Alumni Achievement Award. To read his resume, one may arrive at the conclusion that Keith cain is approaching legendary status, and thus is unapproachable. This couldn't be further from the truth. Keith still enjoys drinking coffee each morning with his personnel. He is often seen at numerous community events because he enjoys interacting with his constituents. He actively participates, annually, in events such as the ''Torch Run" and the "Polar Plunge" for Special Olympics. Everybody knows how much he loves hunting, hosting a deer camp each year, and taking kids hunting on youth hunting days. Above all else, Keith enjoys the time he gets with his family, especially his granddaughters, both of which have grown up in the shadow of this organization, attending ourconferences since they were three. Keith cain is a well-rounded and accessible man with strong moral fiber. Surely, there is no doubting Keith Cain's dedication to serving through law enforcement. He has literally, for 42 years, lived, ate, and slept law enforcement. He almost certainly has resolved to address each and every issue confronting our profession today. He will diligently research the problem, and all possible solutions to mitigate it. If he has formed an opinion, rest assured that opinion is based on the best possible information he could obtain. Once formed, he will vehemently defend his position based on fact, not emotion. I have learned that though we not always agree, Keith Cain is a fair man and open to discussion. I have always found Keith to be gracious in agreement and civil in disagreement. Many times I have heard someone referred to as a "born leader", but I tend to disagree with this assumption. Consistent and effective leadership is forged over time with cumulative experience and knowledge gained throughout one's endeavors. Over time, through trial and error, one gains confidence in his/her ability to manage time, resources, and to communicate with others. One also learns, through trust in others, how to motivate his/her personnel towards the accomplishment of a common goal. More importantly, leadership involves sacrifice. It involves the sacrifice of time, the sacrifice of great effort, and the sacrifice of convenience. A good leader is someone willing to give all his/her effort to accomplish the respective task. In my opinion, Sheriff Keith Cain meets all of the above prerequisites in leadership. He brings to the table an eager willingness to devote the time and effort needed for any calling this organization needed. Though he is not a micro-manager, he brings the unique ability to stay abreast of all facets of the position and to give deliberate consideration to each issue faced. And above all, he has the ability to include everyone under his charge, no matter their rank or perceived importance, and motivate them to achieve lofty goals. The National Sheriffs' Association established the Ferris E. Lucas award in 1995 to recognize an outstanding sheriff of the year for contributions made to improve the Office of Sheriff on the local, state, and national levels, and for involvement in the community above and beyond the responsibilities required. 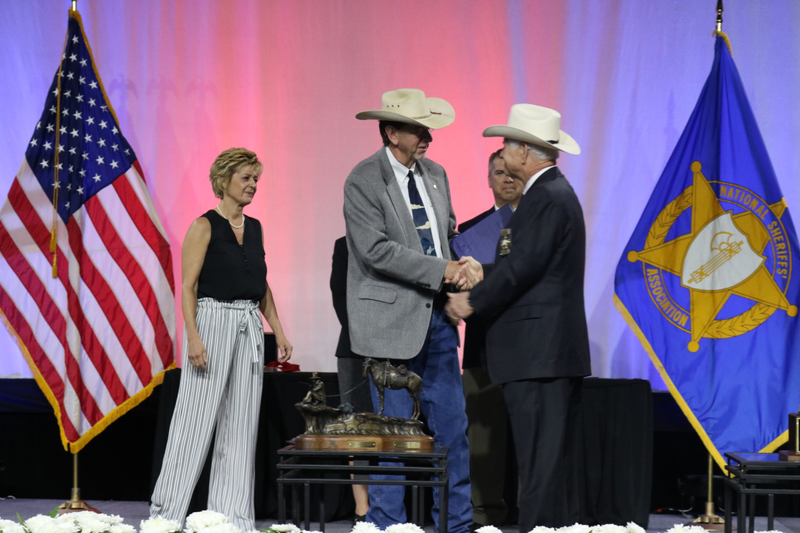 The award is given in memory of Ferris E. Lucas, NSA Past President (1944-46) and executive director (1964-82), who completed 50 years of distinguished service and leadership in law enforcement. This award is sponsored by Pursuit Products, Inc.